Greetings TAY. Today’s Wednesday? Already? You don’t say. And all day, too? Amazing stuff! Did you guys know I write long ridiculous intros sometimes because I’m just using it as time to figure out what next to write? I may be doing it right this second! But how would you know for sure? Anyway, I packed a shoe box yesterday and posted the result on Twitter. I’m rather proud of my Tetris-skills in packing that box. 9 PS4 games (two were steelbooks), 6 3DS games, 1 DS game, 4 Switch games, 2 GBA games (cartridges only), and 2 Vita games. Yes! Tetris taught me valuable life lessons. How many times have you saved me, oh sweet Tetris? Countless times. I’ll be dreaming about tetriminos tonight, as games falling from the sky into a humble asics shoebox. 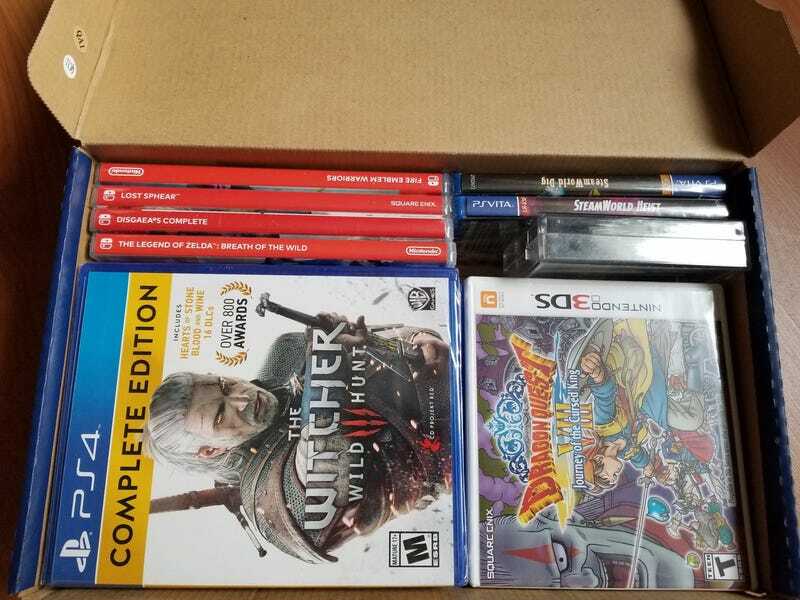 I did not get to put my favorite games in the box, just some I had laying around. But if you could put that combination in (swap out PS4 for any other Sony generation game or Xbox or Nintendo but all else stays! Yep, the Vita is a thing, don’t you sass me! ), which of your favorite games would go into the box? Your life depends on it, TAY, as you’re all being shipped off to an island with a comfortable couch and a TV with electricity available. Don’t question this island. It is magical. What’s your favorite puzzle game? Have you Tetris’d all the things? The best Tetris brick is the stick. Fight me.